In one of the most densely populated cities on earth, space is an issue: Why waste coveted inches on headroom? 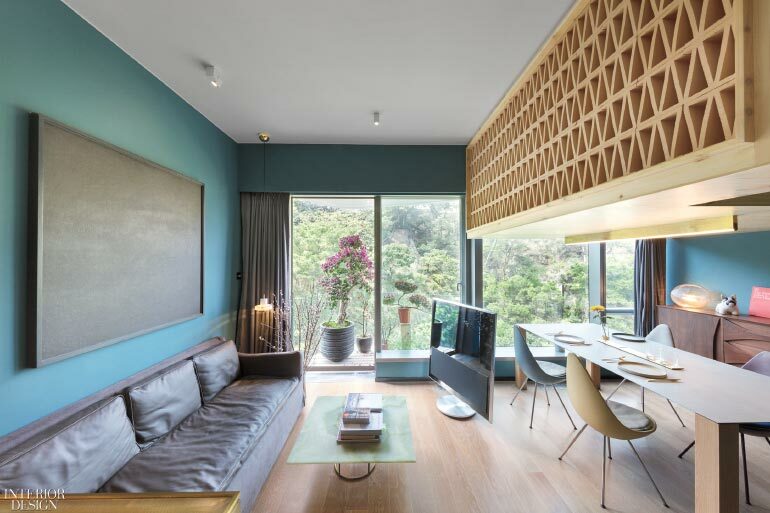 So thought Nelson Chow after buying a 370-square-foot apartment in the , a residential tower designed by with interior fit-out by in the city’s Kowloon district. 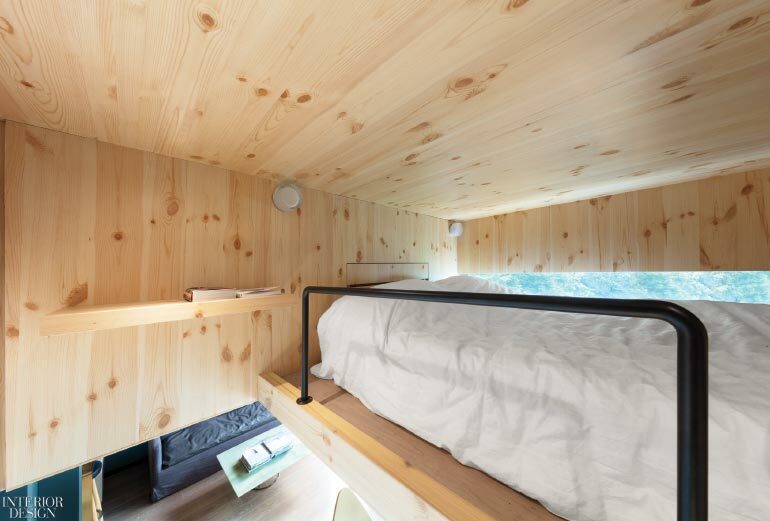 Inspired by tree houses, the principal and founder of maximized space for himself and his French bulldog, Yoda, by removing the only wall and building a pine sleeping loft with a 4-foot ceiling. That move added 40 square feet to the tight floor plan while leaving 6 feet of clearance for the galley kitchen below. “I designed my apartment to fit me,” the 5-foot-7 Canada-raised architect laughs. “And actually, I’m tall for Hong Kong.” (As for visitors over 6 feet, “they can stand in the living room...or sit.”) Moody dark-blue walls and a magenta-flowering bougainvillea tree on the balcony draw in the surrounding forest. Above the living area’s leather-reupholstered vintage sofa, the framed porcelain tile is a piece conceived by homeowner/architect Nelson Chow. Photography by Dennis Lo. A secret tree house is an appropriate home for Chow. An alum of New York–based , he started his own firm in 2011 and quickly captured global recognition for two Hong Kong speakeasies offering access only to those in the know: is disguised as an umbrella shop, while guests must press a hidden stamp to open the concealed door to . 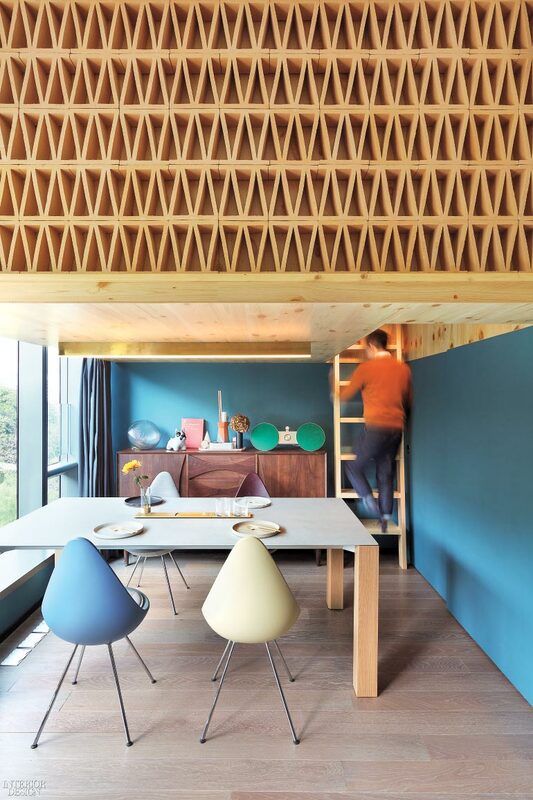 Terracotta-tile latticework demarcates the loft, accessed via a pine ladder in the dining area, where Arne Jacobsen’s plastic Drop chairs flank a custom ceramic table. Photography by Dennis Lo. A powder-coated steel safety rail prevents roll-offs in the loft bed. Photography by Dennis Lo. 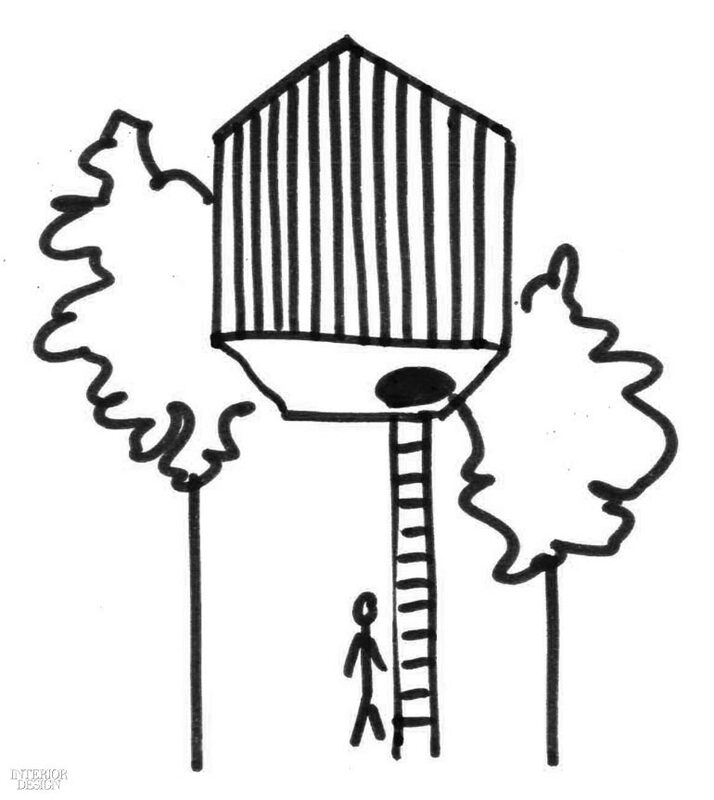 A marker pen sketch shows the tree house concept.